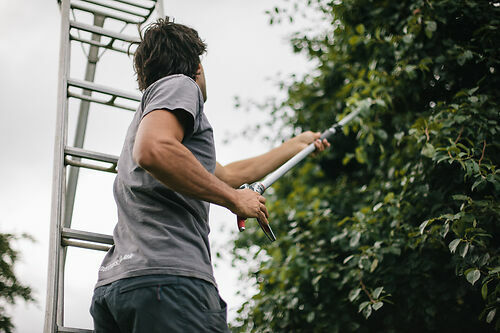 Extending pruner for light pruning - great for climbers, fruit trees and the very tops of topiary. Basically, a good pair of Japanese bypass secateurs on the end of strong, lightweight aluminium handles. Long reach telescopic secateurs for getting at those out-of-reach branches. Ideal for roses, fruit trees and all those situations when getting the ladder out seems a bore. Lightweight aluminium arm easily adjusts from 6' - 10' in three stops. Rust resistant chrome coated high carbon steel blade cuts up to 1/2" branches (depending on plant type, time of year etc*). This, and a 12' ladder, and you're invincible! Niwaki Tip: Don't overdo it - it's hard to see what you're doing, and cutting at a bad angle can damage the blades. Some plants are tougher than others.